I’ve found that it’s so much easier to track how much I’m drinking if I fill up a gallon jug every single morning and just drink from that all day long. Because of the health benefits, I drink lemon water. So I fill up a gallon jug with approximately 10 Tablespoons lemon juice to 1 gallon water. I use bottled lemon juice most of the time, just to save time — and because I’d be going through a TON of lemons otherwise! I buy a new plastic gallon jug every other week. I know some people recommend using glass instead of plastic, but because I take my jug with me much of the day, it’s more practical to use plastic. If I were home all of the time, glass would totally work. 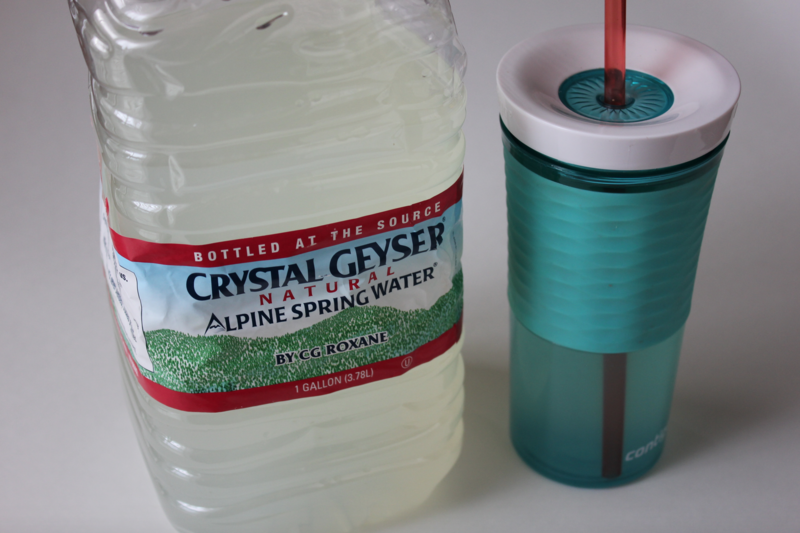 One of the keys I’ve found for drinking more water is to drink from a tumbler that I love. I recommend getting a tumbler with a lid and a straw. 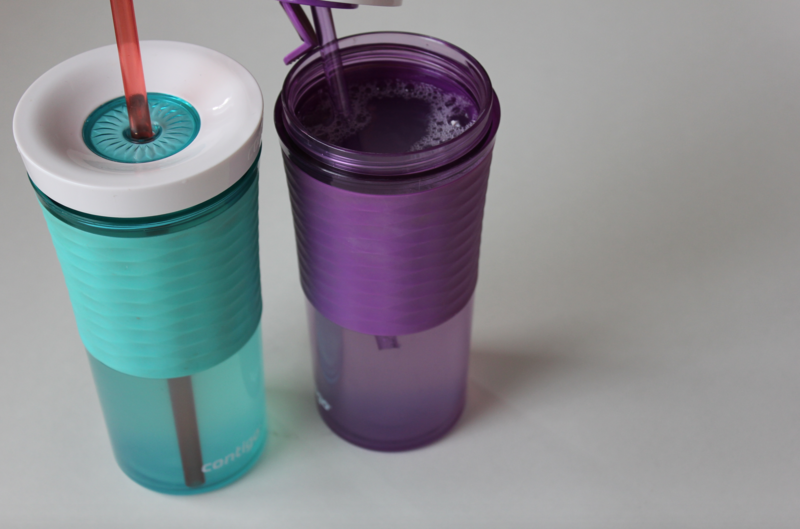 It makes it easier for taking it with you everywhere, makes it more fun to drink, and prevents spills! I use the Contigo tumblers. They are a little pricey to invest in but I use one all day every day, so it’s been very worth it to me. Plus they come in fun colors! Start sipping on water as soon as you get up. Your body is typically pretty dehydrated in the morning and drinking a tall glass of water within 30 minutes of waking will do wonders for your energy and will likely help you feel better, too! I keep my tumbler next to me pretty much all day long and just sip on water as I’m working, as I’m cleaning, as I’m out running errands. I take my tumbler with me pretty much everywhere — even if I’m just running in somewhere for 30 minutes. And I take my gallon jug of water with me anytime I’m going to be gone for longer than an hour. It makes me so happy to see the gallon jug of water going down all day long and I always do a little happy dance when I get down to the “bottom of the barrel”! Note: I try to drink more water in the mornings. I find that I’m thirstier in the mornings — especially because that’s when I work out. Plus, I’ve found that it’s easier to drink more in the mornings. So I aim to only have 2-3 more tumblers of water to drink after 3 p.m. In addition, this will help you sleep better at night — especially at first before your body has adjusted — because you’re not having to wake up every three hours to use the restroom. It will be hard at first and you will feel like you go to the bathroom all. the. time. But don’t give up. Keep with it — even when you feel like you’re crazy for drinking so much water. Your body will adjust over the course of a few weeks and you will no longer be heading to the bathroom twice every hour! 🙂 I promise! In addition, if you’re anything like me, within a few weeks, your skin will start to look healthier and less dry, you will discover you have more energy, you have fewer aches and pains, you rarely ever have headaches, your digestive system is really regulated, and you are hungrier and thirstier — all while you may even lose a little weight! And, if you’re anything like me, you realize that you probably have been dehydrated all of your life and you now love and crave the taste of water and don’t want to go anywhere without having a good supply of it with you!! If you typically spend money on soda or coffee every day, switching to mostly drinking water instead can save you a significant amount of money! For instance, let’s say you spend $1.50 per day on a coffee or a soda. If you switch to water or lemon water, you’ll save at least $450 per year. And that’s even adding in the cost of buy a bottle of lemon juice every other week (about $50 total — depending upon where you buy it from) + investing in nice tumblers ($20). Need more proof? Read this post from a reader on how they save $500 per year by drinking more water. In addition, if you switch from soda or coffee to mostly drinking water, you’ll likely have fewer headaches and cramps, you’ll probably have more energy, you’ll likely lose at least a little weight. Without spending a dime! Note: I’m not giving medical advice here, just sharing what has worked for me. Please do what is best for you and your body and get the advice of medical professionals if you’re not sure whether drinking more water is right for you or not. I’m just answering the question I’ve been asked over and over again the last 21 weeks I’ve been doing this!! I love this! Just reading this reminded me to go fill up my own mason jar because it had been a while. I try and set daily goals to how many times I fill up my mason jar each day before lunch and again before dinner, but I love that you use a gallon jug as the visual reminder. Question, do you still drink a GGMS during the day? Since I’m currently working with a holistic nutritionist (been on his plan for 21 weeks now), I’m only eating/drinking according to that plan. It’s enabled me to get off all the meds I was on for years and feel better than I can remember feeling — well, pretty much ever!! 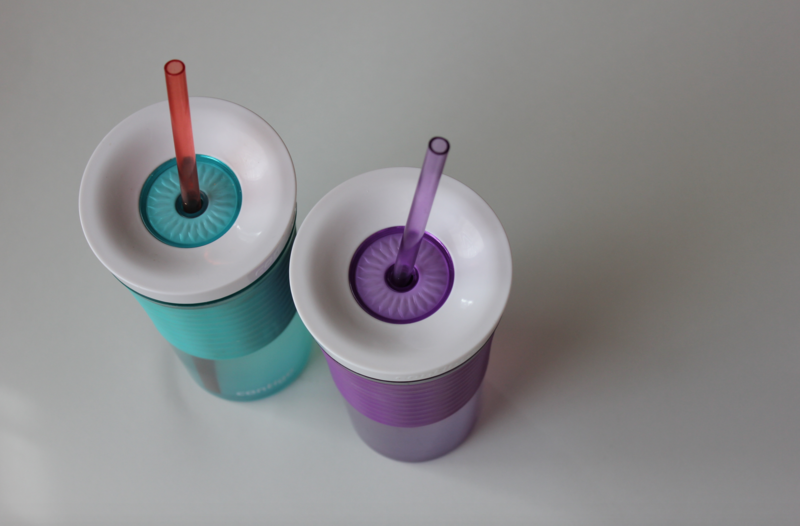 I just re-started drinking my all day THM sippers today and it’s amazing how much better I feel! Keep up the good work. You look great in your new found health! Are there any concerns about the lemon water causing problems with your teeth or digestive system? I agree. Lemon can be corrosive to tooth enamel. I’m working with a holistic nutritionist and this is part of the regimen he has prescribed for me. However, like I said at the bottom of the post, do what you feel is best for you and consult a professional if you’re not sure. I drink from a straw as that protects your teeth, from what I’ve heard. Kudos to you for finding a strategy that works and sticking with it. I am wondering about the effects of the lemon on your teeth though as well. A friend of mine had been putting lots of lemon in her water and ended up with a shocking number (6!) of cavities at her last dental check-up as a result and the dentist said it was definitely the lemon. I would hate to see you end up with big dental bills unnecessarily. From the research I’ve done, I don’t believe there will be any ill effects — only positive effects! — because I’m drinking through a straw and have radically changed my overall diet. My nutritionist has a long track record of encouraging people to do this (in addition to a bunch of other changes in your diet) and none of his clients have had issues with their teeth. If for some reason that changes, though, I’ll of course let you all know. I’m 21 weeks and counting of doing this! Thanks for the reply! The straw option makes sense. And the added nutrition. I wasn’t trying to state an opinion, just was wondering. To counter balance acidity from lemon and protect your teeth, rinse your mouth with some baking soda. Using straw helps too. Perfect timing on this post! I was planning on emailing you to see how much lemon you are putting in your gallon jug each day! Thank you so much for sharing! Is there a brand of lemon juice you recommend? Why lemon water vs. plain water? For added flavor, or for a particular health benefit? Those sippers are SO good!!! Can you tell me more about the sipper? I’m not sure my bladder could handle a gallon/day but I’m sure upping my water consumption (and decreasing my coffee consumption – ha!) wouldn’t be a bad idea. Cucumber water is delicious, now I’m curious to try lemon water. Ah, yes! Cucumber with mint is delicious! I love that your water brand is Crystal Geyser! LoL I tried drinking a gallon of lemon water a day recently but ended up really nauseous the first day after only drinking 16 oz. I also used real lemons and the water was bitter and bland. Do you use real lemons (how many?) or bottle lemon juice? I really want to start doing this 🙂 Thanks! I get nauseated as well, hard to push the water when you feel sick. I commend you for the gallon, that’s a lot of water! I go back and forth with my water consumption. What I find works for me is to keep an infuser pitcher on my desk, fill it with ice in the morning and top it off with water. I need my water to be super cold. I’m the infuser I’ll put either cucumber and mint, lemons, oranges, basically any fruit that is fresh, in season or on sale. How do you keep the water cold? I really dislike water but know I need to drink more of it. I just don’t think I could drink that much water if it got warm. I occasionally put ice in it, but usually I just drink it straight from the bottle and don’t worry about it being freezing cold. I am a cold water drinker. I stole the tumbler my hubby got at his company Christmas party LOL. The brand is RTIC (it’s the cheaper brand compared with YETI). I found them online for $10. They are double walled metal. They really don’t sweat and they really keep drinks cold. His is 30 oz., so I know 4 is pretty nearly a gallon. I’ve fallen off the water wagon lately. I have got to get myself a jug! 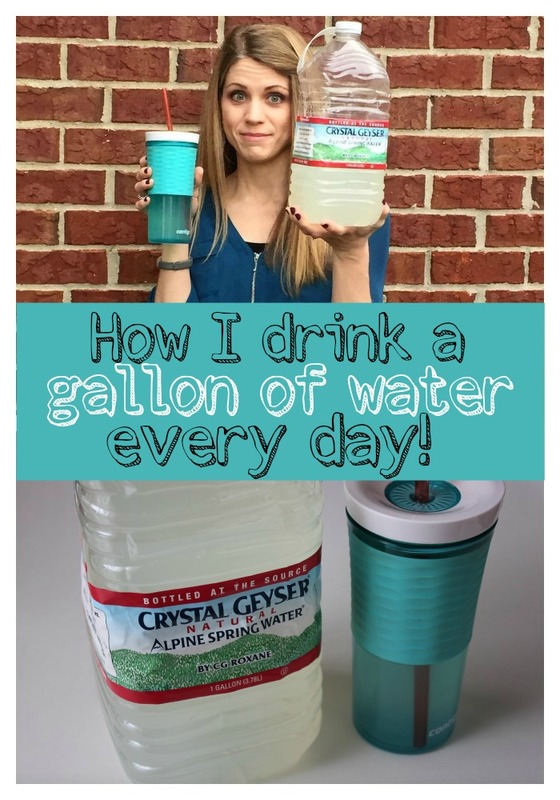 Refilling from a gallon jug is a great idea! I’ve been drinking from my 16 oz canteen, but sometimes lose track of how many I’ve had. I’m going to try your idea! It’s made SUCH a difference for me. A super easy way to track without me having to try to remember! Hmm, maybe I should try this. I tried a cup of warm lemon water first thing in the morning for several months straight and it didn’t help me at all so I got discouraged. Supposed to help digestion, liver, skin. etc. But maybe just one cup is not enough for me! I don’t do coffee, or soda, but I do love to drink herbal teas. Maybe I could get in a half gallon, plus my teas. Do you drink anything else at all, and if you do, do you still finish your gallon, too? I LOVE the contigo water bottles that you depress the button with your finger. They do not leak or spill all over your desk. I like that it is one handed but not a straw. I have a 32 oz one at home which I fill each morning and have for the evening. I keep another one on my desk which I try and drink each day. I also drink 16 ounces with my vitamins in the morning and 16 more ounces when I brush my teeth at night and sometimes other water through out the day. I feel so much better when I drink a bunch. I need to add more in again. I love the idea of lemon juice instead of buying lemons and keeping them fresh. Thank you for the tip! It is a huge savings when you eat out to order water! I only drink water so no coffee, pop, milk or juice for me which helps the grocery budget. I am thinking that if I had the jug that I had to haul home each day from work, it might be more incentive to drink it all. I read somewhere to take your body weight in pounds, cut the number in half and drink that many ounces of water. So I am 265 pounds, half is 133 so I should drink 133 ounces per day which is slightly over the gallon mark. Yes!! I didn’t mention ordering water at restaurants… which is one way to save a LOT of money, especially if you eat out regularly! This is so encouraging. I am trying to drink more. It’s not about drinking more water, just drinking in general is hard for me to keep up with. I work to drink three tumblers of water a day. That’s a really big success for me given the fact that I hardly ever remember to drink anything. I’m trying to up it more! Thanks for sharing your strategies. Thank you for this! I too am doing the 15-day course, and drinking more water is my first goal to reach. Do you drink anything besides water at all? Very encouraging post. I don’t drink nearly enough water. I have no doubt that most of my health concerns would be fixed with hydration. Thank you for great motivation. I’ve always consumed large quantities of water. Love it! A couple of years ago I started drinking decaffinated Earl Grey green tea in place of the water. Thanks for the information on lemon water. I’m going to give it a try. I drink my water room temp – the body has to work hard to get it down to that temperature or warmer if it’s drank cold. And I have Raynaud’s…so I hate being cold. Don’t know if strawberries may cause tooth problems, but I put them in my water for a refreshing change! I really need to do this, or at least drink more then I do, I definitely don’t drink enough each day. IM going to start today, thanks for the encouragement! Also where is your top from ? Its really cute. We love the Santa Cruz lemon juice. It’s so fresh tasting and almost sweet–I have had just lemon water satisfy a craving for lemonade before 🙂 My hubby puts it in seltzer water (we like the flavored kind but with no added sweetener at all–I know it’s “natural flavor” but it’s still gotta be better than soda!) and it’s helped him stay away from soda. He doesn’t like the seltzer plain, but with lemon it’s a new favorite for him! I am starting a new routine at the gym and my coach asked me to start drinking 1 gallon at day and make sure I have breakfast. Today is my first day: thankful to know that I won’t need as many bathroom breaks soon! ? What a great article! I just refill my tumbler 6 times a day, but I think that filling from a gallon jug would kick my competitiveness into high gear! I’m gonna try it! Crystal – have you thought about using lemon essential oil? It promotes the same benefits but without the citrus. I love it! You may want to ask your nutritionist. Just a thought. Love this! I’ve been drinking a gallon of water per day for a few months now and what a great energy boost!! I used to think I needed more coffee but my body really needed water. Since I’ve increased water (and exchanged the coffee for tea) I can tell such a difference. Thanks for sharing! This is really encouraging me to try this! Thanks for the how tos, I always love the practicality of your posts like this! A couple quick questions: When you fill up your gallon do you refill it with tap water or some other source? If it’s tap do you have a water filtration system or do you use just straight tap? I read so much conflicting info about water sources but I always love your simple approach to things so I’m curious how you’ve approached what water you’re drinking. I’m excited to try this, your glowing skin and shiny hair is selling me on it!! We have good water, so I just use straight tap. I know there is conflicting info out there about this, but that’s where I’ve landed. If we move somewhere where the water isn’t good, I’ll have to come up with plan b! I have a 24-ounce Tervis cup that I fill up with water. Luckily at my office we have a Culligan purified water cooler so I fill up for free. For those of you who wear a Fitbit, on the app there’s a place where you can track how much water you drink each day. For those that are concerned about the effects of lemon water on teeth– I’ve heard that a lot of the nutrients from the lemon can be found in lemon essential oil. So to get those nutrients without the dental concern, my sister puts one drop of lemon oil in a smaller glass in the morning and drinks it down, then the rest of the water consumed that day is plain (or infused with something else like cucumber). How much lemon do you use? Are you using fresh lemons or lemon juice and how much? my particular method is that I have a 44 oz bottle and I fill/refill it three times (ends up just a bit over a gallon a day) But, I aim for emptying it once by noon, once more by 3:00 pm, and a third time by 6:00 pm. I don’t always make it but I try to finish no later than 7:30 so that I don’t have to get up in the night. Still waiting for my body to adjust to the increase in water consumption though, I have been up to a gallon for a little over 2 weeks now. I was wondering- what kind of water are you refilling the jug with (tap, purified, spring)? I already drank a lot water before, but I started adding lemon. I was squeezing lemons, but was having trouble enjoying this enough to do it regularly. Today I bought lemon juice from Costco. So much better. I could manage it this way. Tip for others doing this…I bought 2 bottles of organic lemon juice from Costco for 7.89. Each bottle is 33.8 ounces. I thought that was a pretty good deal. Just wanted to thank you for sharing your practical tips on how to drink water! Hubby and I are racing each other. I love lemon water. Been drinking it for years! I use fresh lemons. I slice a lemon and keep in a rubbermaid container. Each refill I squeeze another lemon in my cup. I fill my Yeti cup with ice cold water at night with lemon and its so refreshing to drink when I first wake up. I do drink from a straw and have never had a cavity in my 40 years of life. 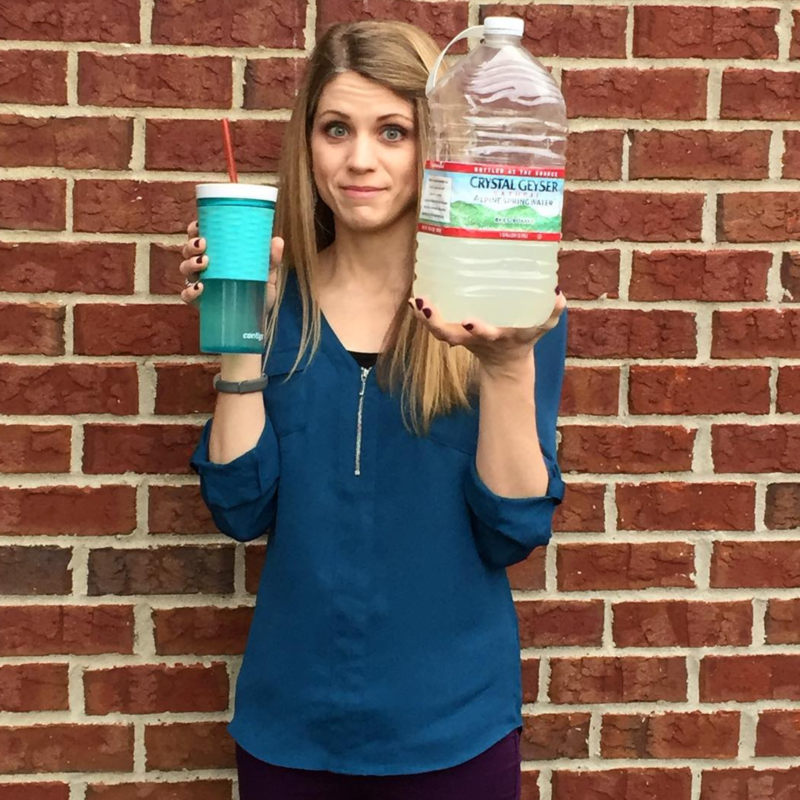 I have always heard for weight loss to drink half you weight in ounces of water. So I’m up to around 70 ounces a day which is very doable! I’m challenged now to get to a gallon! I drink about a gallon of water every day and I have to disagree about your body adjusting and you pee less. That is not true with me. It’s been 3 weeks and I’ve gone even longer in the past and it never subsides! I do try to drink all my water by 6pm so i don’t have to pee through the night but I still do!! ARGH!! But I loved this article. Thank you for sharing. Maybe try doing it for at least 2-3 months and see if your body adjusts? It has for both my husband and me, plus others I know. Is there a certain brand of lemon juice you prefer? Considering this as I love lemon water but don’t have to have to spend the time like you mentioned going through TONS of lemons! I was wondering if you could possibly share the name of your holistic nutritionist. I believe I have seen that we live in the same area. You can email it to me if that works better: themockfamily@comcast.net. Thank you! What an excellent idea! I have tried and failed many times to drink enough water throughout the day. I’ll be getting my jug of water. My only recommendation is to be cautious when sipping on lemon water all day. It may taste great but the acid can be harmful to your teeth. Instead of adding it to the entire jug, maybe just add it to one or two refills throughout the day so that you can brush your teeth and decrease the damage to your teeth. I drink water all day everyday. Idk how much exactly but probably close to a gallon. Now if I don’t properly hydrate I get a bad headache and feel terrible. My body gets angry if it doesn’t get its water!